Do you want to get married on a stage with 5,000 guests viewing the ceremony? You can certainly do that at the Mountain Winery. While that is an option, this couple choose to have their ceremony on the Chateau Deck with its panoramic views of the Silicon valley. 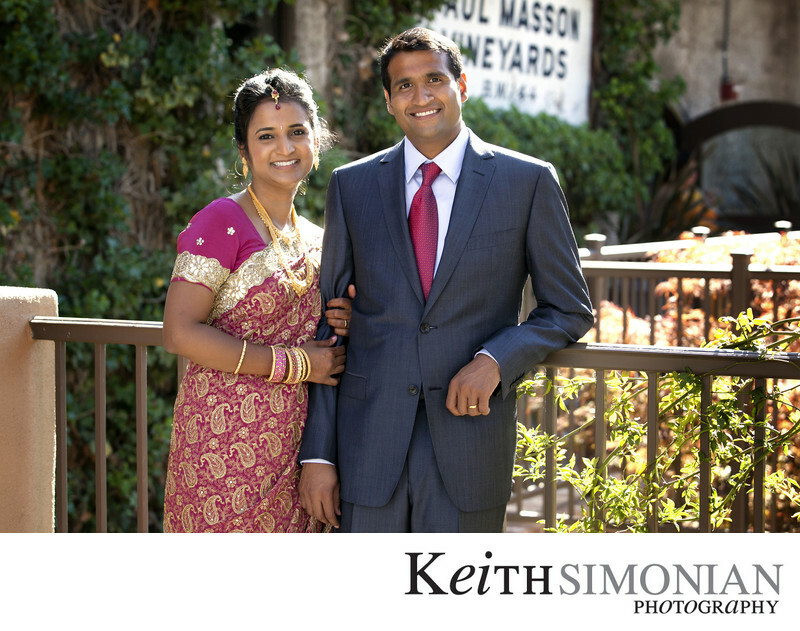 After their South Asian wedding ceremony on the Chateau deck, their guests were treated to more wonderful views of the South Bay Area during the wedding reception from the Winery Deck. Their buffet meal was served on the Winery deck and all the reception festivities took place in the Grand Hall of the Historic Winery building. The Mountain Winery offers many great backdrops for photos of the Bride and Groom. This photo was made just outside the Winery building with its Ivy covered walls and lush greenery that covers the grounds. Location: The Mountain Winery 14831 Pierce Rd Saratoga, CA 95070. 1/500; f/4.5; ISO 400; 90.0 mm.